"Red Envelope" redirects here. For the loot, see Red Pocket Envelope. The Red Envelope Mouse is an Event Mouse found during the annual Lunar New Year event. Information on how to locate and capture the Red Envelope Mouse can be found on the current Lunar New Year location page. 12 February 2010: The Red Envelope Mouse was introduced as part of the Heart of the Tiger. 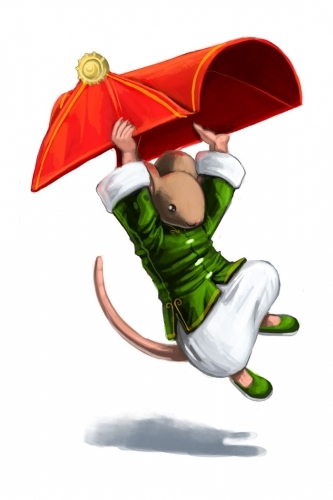 The amount of points (888) awarded on catching a Red Envelope Mouse, and the amount of gold held in the loot drops (222 and 888), reflects the belief that the numbers eight and two are "lucky" in Chinese culture; a sequence of a "lucky" number is considered even more favorable! "There is a tradition among the mice who participate in the Lunar New Year celebrations. Some mice exchange red envelopes with each other, filled with gold that they have looted from poor, unsuspecting hunters. Red boxes, red envelopes? Coincidence? We think not." This page was last edited on 8 February 2016, at 21:24.